Love sports and learning about sports? You believe yourself to know all about your favorite sports? Are you sports enthusiast who just loves to know more of his game? If you said yes to any of the questions, then this SportQwizz review is for you. 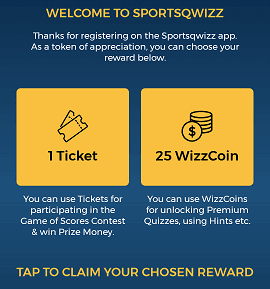 SportsQwizz is a sports-only quiz-app where you can test your knowledge about the sports you love and learn more. And to make it more exciting you can you can play sports quiz contests against other players to win cash. You can also have fun by predicting the outcome of various sports matches. 1. Download the SportsQwizz app from here. 2. Open the, tap on "Get Started". 3. Sign in either with Facebook or Google+. I suggest you should select Ticket as you can use the ticket to participate in “Game of Scores” Contests and win cash prizes. On the other hand, WizzCoins can only be used to unlock premium quizzes and for hints for questions during quizzes. Here’s where you put your knowledge to the test and participate in quizzes to win cash prizes. You can participate in contests related to sports like Cricket, Football, Badminton, etc. To participate in these contests you need tickets. You can purchase tickets from the store. If you buy one ticket it will cost you Rs.70. And if you purchase a combo pack each ticket will cost you less depending on the pack. But since this is your first contest you already have one ticket if you chose ticket as ‘reward’ after sign up. So your first contest will be free. To claim your entry first you'll need to verify your email address. After you have entered the contest, you will be able to play the quiz. You’ll have 15 seconds to choose the correct answer for each question. Your rank will depend on the accuracy and time take to answer the quiz. Currently "Game of Scores" is only available for users in India. This mode is just for fun and to gain knowledge. You can play quizzes based on different sports solo or against a friend. And for show off’s sake, you’ll also have levels to play for. Here you can play prediction game or you can make prophecies for the result of matches. Again this is just for fun. You won't win or gain anything. SportsQwizz gives you the option to choose your reward for each invite just as it allows you to choose your sign up reward. For every friend that accepts your invite & registers on the app. You will be able to redeem the invite for Wizzcoins or Tickets. Whaff Rewards App Review: Is it Legit or Scam?